Medical plant jung rabab or Baeckea Frutescens L in the name of botanical shaped shrub to shrub, to 5 m tall, skinny branches. Leaves opposite, very narrow leaves such as lines , thickness 0.8 mm and a length of 5 mm to 16 mm. Flowers axillary of leaves, small, about 1.5 mm in diameter; short flower stalks; calyx campanulate with 5 parts; canopy 5 pieces, a little round, white with green ring in the middle and gradually changed to red; stamens 10 the fruit. Diversity. Plant height varies, depending on the state of the place grew. Plant height of 30 cm has been fruitful. Ecology and distribution. 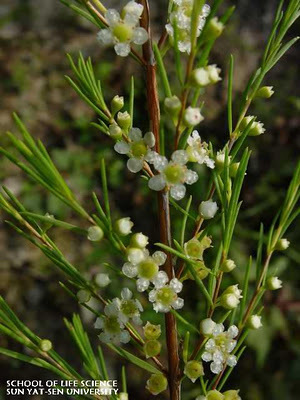 Grows wild South China coast and the mountains of Sumatra and Malaysia at an altitude of 600 m to 2,200 m above sea level, is also found in Australia. Prefers semi-arid regions. Aquaculture. this medical plant is wild plant, not cultivated. NATURE SPECIAL Spicy and aromatic. Analgesic, antispasmodic, tonic, and diuretic.